Here is a selection of our testimonials that give an insight into the way we work here at Landermeads and the experiences of our family members and their loved ones. What is particularly striking is the genuine commitment the staff have for giving exceptional care and enabling people to not just be residents in the home but to be ‘family members’ who are ‘living’ in the home. 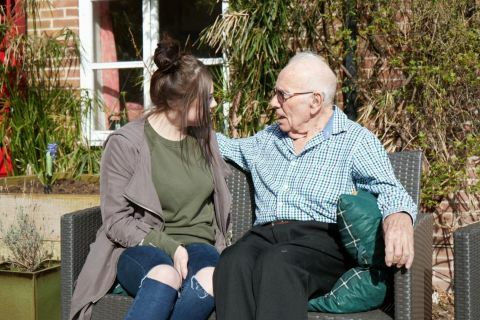 When you visit Landermeads, it is impossible not to be struck by the way in which staff connect emotionally with family members and indeed everyone who visits the home. I have experienced this when visiting - everyone I met greeted me with a welcoming smile and eye contact. When you spend time at Landermeads, you notice how staff never pass by a family member without making some kind of authentic emotional connection; words, eye contact, touch. The impact of this is very evident, family members looked relaxed and comfortable, there is chatter, activity and feeling of togetherness. My lasting impression of Landermeads is of a warm, colourful and welcoming home, that really is a home to the family members who live there. Having visited many care and nursing homes in my time as a Social Services Inspector, I was bowled over by the design of the home and the way that it has been decorated and furnished to provide comfort and intimacy for family members. Staff are welcoming and friendly and their values of placing priority on emotional well-being creates an atmosphere of kindness and compassion that is tangible. Both inside the home and in the outside spaces, you can see the different ways in which family members are helped to live fulfilling lives, and this is being extended gracefully and compassionately to the way that people die and how they are remembered too. 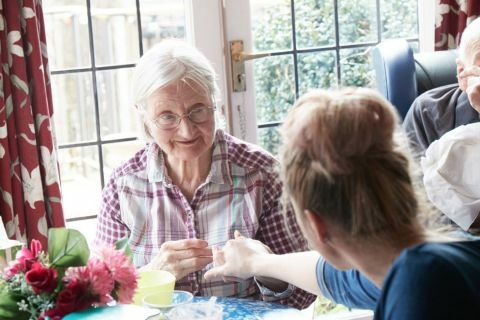 In January 2012, Landermeads undertook the necessary training under Dementia Care Matters to become a Butterfly home and it was a significant turning point. Sue, Kevin, Brian and I were by this time visiting M more frequently. What we witnessed was the staff and residents (lovingly and movingly always referred to as "family") in a real home, the very core of which is based on LOVE. The family laugh together, cry together, share, care and love one another. The change in ethos had a profound effect on M - she responded and blossomed under their loving care. She became more relaxed and laughed often and our visits were loving, pleasurable and fun though she was still able to let you know when she was not well pleased!! Any difficulties were handled by the staff with great sensitivity, knowledge and skill, diverting attention where necessary from whatever the problem scenario was. Such was her personal care together with some ingenious problem solving by the excellent care staff, the serious skin problem was relieved and kept at bay. The staff constantly engage with the residents, love and hugs are ever present - it is a comfortable and pleasant environment where individuality is recognised and encouraged. We have spent many hours in the Meads, none of us more so than Sue, and have witnessed at first hand the amazing work they do and the results it brings. As I have said to many people, the love and exceptional quality of care within that home just knocks your socks off! As a writer, I don't normally struggle for words but it is difficult to come up with the adjectives to describe what the team at Landermeads do caring for people living with dementia. Its like trying to describe how water flows effortlessly & beautifully over rocks in a river. They make it look that effortless & natural but you know the boundless energy it requires on a daily basis. 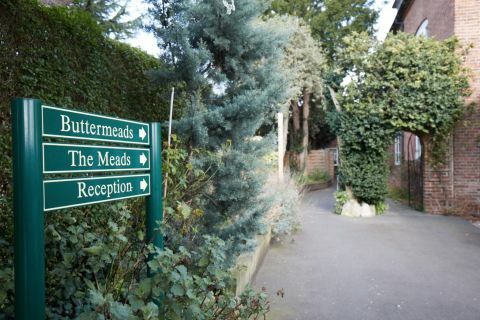 A care home is merely a pile of bricks -it is the people who live within it and the community that creates its feel... Landermeads feels like your favourite slippers, a warm glowing hearth or a big cuddle. 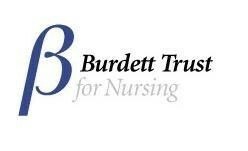 As soon as you walk through the door you feel it from everyone living there & every member of staff. Choice is everything. 'Person-centred' & 'dignity' are buzzwords liberally spoken about in care but not always acted upon & backed up but at Landermeads it means that every decision has the person & their wishes at the centre of the wheel. Nothing is deemed ridiculous if it is what somebody wants. Nothing is too much. This is care without compromise. Identity is everything. Realising what makes people laugh, enjoy the moment & thrive on togetherness & community. The smiles on every face and the laughter says it all.